After yesterday's starters it's time for ideas for main courses. I love ham and turkey but have included a vegetarian Christmas recipe for people who don't eat meat and/or fish. The ham should, depending on the size, be defrosted in a cool place for a few days before cooking. Place the defrosted ham, rind side up, on a baking tray in the oven. (You can also place it on the griddle with a baking tray under it). 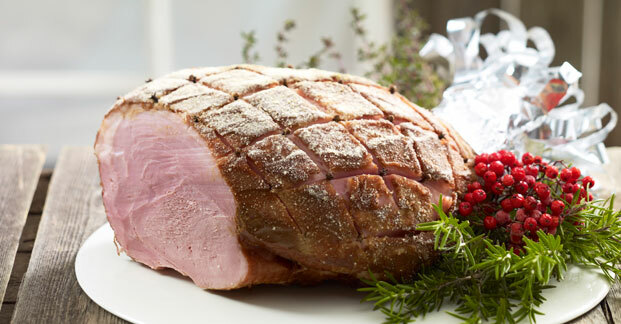 Insert a meat thermometer into the deepest part of the ham, making sure that the tip of it does not touch the bone. Cook at 90-125 degrees Celsius until the meat thermometer shows 77 degrees (Tip: Ham needs to be cooked for approximately one hour per kilo). Add water to the baking tray during cooking, if needed. After the ham is cooked remove it from the oven and allow it to "rest" for a while, before removing the meat thermometer. Cut away the rind from the warm ham. Spread mustard on top of the ham. Mix the breadcrumbs and sugar, and sprinkle the mixture over the mustard. Decorate the top of the ham with some cloves. Cook at 250 degrees Celsius for approx. 10 minutes until oven-browned. You can prepare sauce from the skimmed stock of the ham. Strain the stock from the baking tray into a saucepan. To be able to skim the extra fat off, set the stock aside to cool. Heat up the stock together with whipping cream, some honey, thicken with flour and allow it to simmer for a few minutes. The stuffing should preferably be prepared the day before the turkey is cooked. Cut the bread into small cubes and slightly moisten with water. Mix together a finely chopped onion, bread and the seasoning. Store in a cool place over night. Sprinkle the turkey, on the inner and outer sides, with salt and white pepper and stuff with the bread mixture. Tie up the opening with a wet cotton thread. 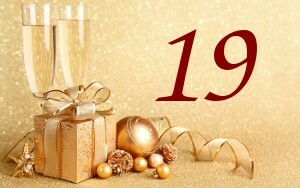 Place the turkey into a roasting bag, breast side up, and cut a small hole in the upper corner of the roasting bag. Place the roasting bag on a baking tray and cook at 175 degrees Celsius (A four kilo turkey needs approximately 2 ½ - 3 hours to cook). If you use a meat thermometer, the turkey is ready when the temperature reaches 77 – 79 degrees. 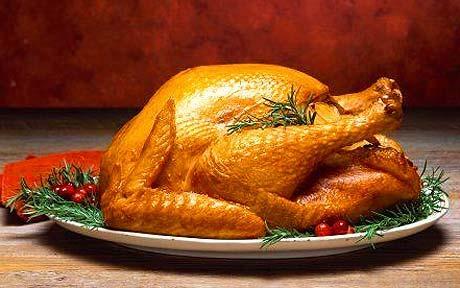 Baste the turkey with melted butter and roast in the oven for a few minutes at 250 degrees Celsius until oven-browned. Let the turkey "rest" for 20 minutes before serving. Tip: The broth from the turkey can be used to make a sauce. 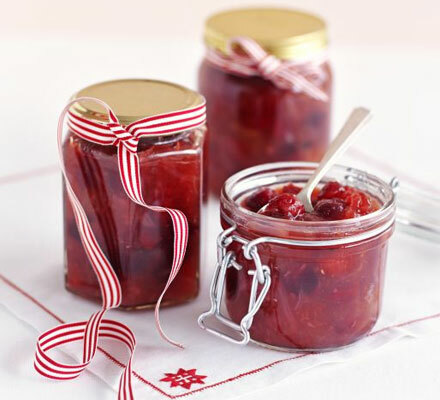 Why not serve your Christmas Ham and/or Turkey with cranberry chutney? Peel and cut the onion into strips, place them into a saucepan with oil and allow them to soften. Add the curry and let the onions simmer for a few more minutes. Put water and cranberries into a separate saucepan and bring to boil. Add the grated ginger, vinegar and the onion-curry mixture and simmer at low heat for approximately 20 minutes. Stir occasionally and mash some of the cranberries with a spoon. Set aside to cool for a while and then put into clean glass jars. Why not have a Very Merry Vegetarian Christmas with this vegetarian recipe? Boil the beetroots until tender and then peel them. Chop the onion finely and fry in oil on a pan for a few minutes. 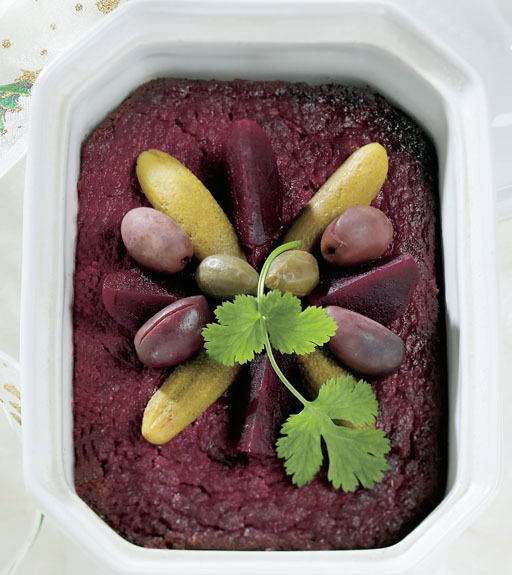 Use the kitchen blender to puree the beetroots together with onion. Add eggs, cream, blue cheese in crumbs and the seasoning. Blend well and pour into a greased baking tin (a 1 ½ liter baking tin). Place the casserole on a baking tray (with high edges) and pour water on the tray. Cook at 150 degrees Celsius for 1 ½ hours. Turn the cooled pate over onto a serving dish.